On Vijayadashami day, the Jamboo Savari – the Mysore Dasara Parade – is held on the streets of Mysore city. 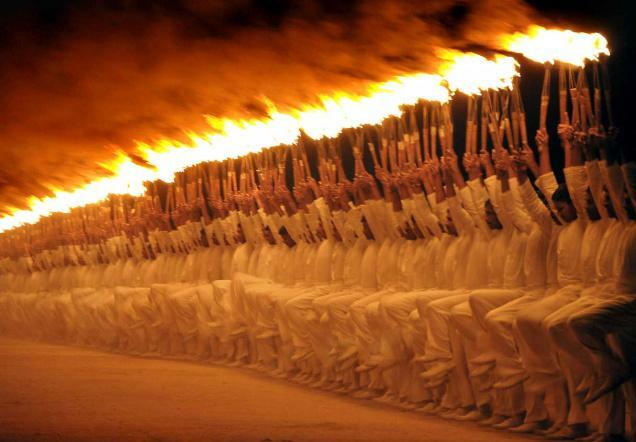 The original name of this procession was Jumbi Savari or going to the Banni (Shami) tree. According to the Mahabharata, the banni tree was used by the Pandavas to hide their weapons during the one year they lived incognito. Before any war, the kings traditionally worshipped this tree to help them emerge victorious. 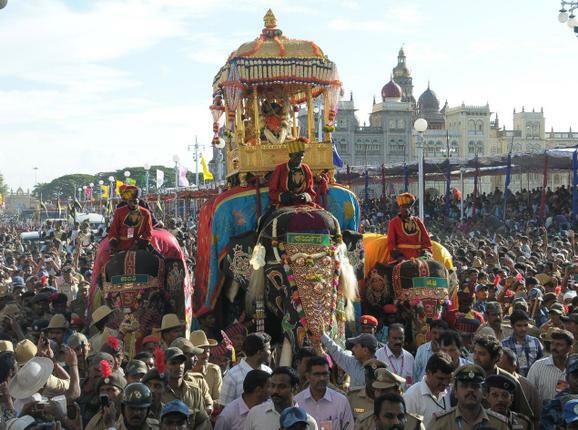 The elephant procession was referred to as Jumbo Savari by the British when they took over Mysore State. The 5 kilometre long procession starts from the Mysore Palace and finishes at a place called Bannimantap (where the banni tree is worshipped). The idol of the Goddess Chamundeshwari is worshipped by the royal couple and other invited guests at the Mysore Palace. The idol is then placed on a golden mantapa on top of a beautifully adorned elephant and taken on the procession. This centuries old tradition reconnects the Royal City to a bygone era. Beautifully decked out elephants, folk art performances, colourful tableaux, lively music bands, and majestic horses and camels form part of the procession to Bannimantap drawing awe from the watching crowds. In recent times, the procession has also roped in paragliders to add glitz to the festivities. The Dasara celebrations culminate on the night of Vijayadashami with the Panjina Kavayatthu (torchlight parade) held at Bannimantap. The Maharaja, dressed in his riding clothes, makes an entry on horseback to the parade grounds. He is saluted by his military units. Lights would be lit up to welcome the Maharaja and his military officials. Only military units participate in this organized parade. The original purpose of the parade was to instil confidence in the people and to showcase the military capability of the ruling king. Now the whole occasion showcases the grandeur and majesty of the erstwhile rulers and offers the people a glimpse into the history of the state. The parade also includes an equestrian show and a feat of acrobatics on motorbikes. The much lauded programme of the day is the laser show organized on the parade grounds. The entire parade comes to an end with the playing of the national anthem of the erstwhile Mysore state by the military band.